Jo Jo is an Edinburgh Goodfella with a sharp mind and a cavalier attitude to the law. In the bleak, edgy climate of the 1980's Jo Jo is seen by many on the estate as a hero; out-manoeuvring the police while supporting his close-knit family. What is it that draws the confident and charming Jo Jo to Lorraine, a vulnerable woman obsessed by Marilyn Monroe? What figure from his past is fuelling his fantasies and driving him towards darker crimes and the quicksand of heroine. Can Jo Jo look after himself when he doesn't know who he is. LOOKING AFTER JO JO BBC2, 9pm. Frank Deasy's four-part drama about crime, drugs and Aids in Edinburgh in the 1980s may turn out to be one of those projects it is easier to admire than warm to. It is not just the grim subject-matter, unleavened by any but the most desperate humour. The bigger difficulty is asking us to empathise with a central character who has few redeeming features. Jo Jo (played with his usual presence by Robert Carlyle) is a small-time crook who becomes a bigger one as he switches from stealing cigarettes to dealing drugs. He is haunted by the early and unexplained loss of his father, though we are left waiting to discover whether this is the key to his life of crime. The piece is tightly written (though non-Scots may have trouble with the brogue) and atmospherically directed by John Mackenzie of The Long Good Friday. It is still hard to like. Hopes are high, in a different way, for the remaining three episodes of Looking After Jo Jo (BBC2). Robert Carlyle is never less than mesmerising, but last night's opening instalment was like watching Marco Pierre White struggling to make a feast out of baked beans and tinned Spam. Let's hope Carlyle's larder gets slightly fuller by next week. LOOKING AFTER JO JO BBC2, 9pm. The Guardian Thursday January 8th. Leave Me Alone - Begbie won't stand for it. Robert Carlyle, star of Trainspotting and The Full Monty is being hounded out of Scotland - by a bunch of journalists. Lawrence Donegan meets a man under siege. He still lives in Glasgow's West End, less than a mile from the street in Maryhill where he was brought up by his father. "It's important to me to be here, because most ofthe stuff I do reflects the life around me. It keeps me grounded, it keeps me sane. Even London is too much for me," he says. Carlyle didn't have to travel far to play his latest role, as drug dealer Jo Jo McCann in the series Looking After Jo Jo. Written by Frank Deasy, the BBC's four-part series is set in 1982 and traces the formative years of the Edinburgh's heroin explosion. It has a great soundtrack of Jam songs and some fine performances from the likes of Jenny McCrindle and Kevin McKidd. Looking After Jo Jo bears a superficial resemblance to Trainspotting. "Hey man, it's just like Hill Street Blues, one character enthuses as he watches his mate shoot up for the first time but it doesn't have the movie's ambivalence towards drugs. And, like most of Carlyle's work, politics is never far beneath the surface. "I wanted to do the piece because it seemed to concentrate on a period that has largely been passed over, the early eighties. When I first started working as a painter and decorator, this was the kind of stuff that was going on around me," he says. "It makes it easier for me to live my life as an actor if I can speak in a coherent way about the stuff that I choose to do. There would be nothing worse for me than to do a picture that I didn't have anything to say about. If I thought it was going to be like Trainspotting, I would never have done it." The series was filmed mosthly on Edinburgh's Sighthill estate, which made life a whole lot easier for Carlyle. "It's a world that I know. When we got to Sighthill, it was just a case of talking to the guys there. It was almost as though Begbie was their mate, and it was very easy for me to be accepted. It had same atmosphere as the place I was brought up in." Despite a cortege-paced narrative Looking After Jo Jo has enough wit and moral backbone to take its place alongside other recent gems in Scottish drama. For his part, Carlyle believes it to be one of the best projects he's ever been involved with. However, it's likely to be his last in Scotland for a while at least. Looking after Jo Jo episode one first screened on Monday 12 January 1998 on BBC2. Now as drug dealing lowlife Jo-Jo McCann in BBC Scotland's new drama Looking after Jo Jo, Carlyle is playing to his strengths. JoJo is vulnerable, prone to neurosis about his relationship with his dead father, capable for falling for a teenage Marilyn Monroe impersonator, yet not averse to dressing up in a giant rabbit costume and laying into his enemies with a razor (Carlyle could fill a wholeCV with stabbing scenes alone). "Looking after Jo Jo was far more psychologically draining than The Full Monty" he says. "There's more toThe Full Monty than meets the eye, obviously, but something like JoJo is in a different darker mould. That's something I enjoy." Frank Deasy's script for Looking after Jo Jo shapes up as a kind of Trainspotting prequel, without the distancing coolness. Set in 1982, it sets out to trace the beginnings of Edinburgh's relationship with Heroin in the eighties, and the repercussions of crime and Aids. It will have an impact, not necessarily for the subject matter( as Deasy points out, heroin usage these days has lost it's sensationalist impact), but for Carlyle's portrayal of Jo Jo as one of the heroin trade's first exploiters, and, eventually, victims. Directed by John Mackenzie, who was responsible for The Long Good Friday, it is direct, untrendy, believable. "By the end of it, it's a terrible spiral that happens withthis guy,"says Carlyle,"If Looking after Jo Jo was a Shakespearian playit would be considered a tragedy, a fantastic beautiful, horrible tragedy. In a sense that's what this is. The redeeming quality in a sense is that it's almost inevitable what's going to happen to this guy. It's human weakness. In the first episode I've tried my best to make him as attractive as possible, as interesting as possible, so that by the time three and four come you think, well there was someone in there originally. As he says at one point, you take your chances in life. He's just taken the wrong chances. In a sense he's as big a victim as anyone else." Audiences are conditioned these days to perhaps be surprised to see a big screen star like Carlyle back on the tv so soon. The accepted pattern is, once you've conquered the film world,to turn down all small screen offers until you're on the way down. Carlyle doesn't see it that way.
" I don't think anybody expected me to do tv at all this year. I shocked people by being back doing stuff for BBC Scotland. The simple answer is that it was the best script that came in. I was fortunate enough at the time to be given quite a few offers, but the best one just happened to be 200 yards across the road from me. The combination of John Mackenzie and Frank Deasy was tasty." He's experienced enough to appreciate that films, by nature of being 90 minutes of commercially pressured entertainment, involve compromise. Television can allow the sort ofcreative input Carlyle relishes. "I feel with tv you're allowed more freedom. With television theres more time to create something through the episodes. The fact that you're working harder, on the surface seems more difficult, but you get into a way of working where if you're not allowed to stop and breathe and think about it, you just go on instinctively, which is the way I prefer anyway. I becomes a more spontaneous thing. With Begbie, Trainspotting is a 90 minute movie and Begbie has a certain amount of screen time within that. It's about maximum impact in a sense, so the performance is larger than life, bigger than it would normally be. But when you're dealing with a character like Jo Jo McCann you've got four hours to tell the story, so you can relax and back off a little bit. There's much more detail involved, so that gives me much more scope in which to work"
* Four x 50 minute episodes. * Described as "Our Friends in the [Far] North". * Set in Glasgow in 1982. 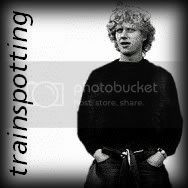 * Point of interest: Kevin McKidd, who plays Basil, was one of Robert Carlyle's co-stars in Trainspotting. John Joseph (Jo Jo) McCann has been a habitual criminal since childhood, when he pilfered cash boxes for his dad. He's been in and out of prison ever since. He lives in a high rise council flat with his mother and sister. Basil (Kevin McKidd), Big Danny (Michael Nardone), Lorraine (Jenny McCrindle), Charlie McCann (Ewan Stewart), Christine (Aline Mowat), Thingme (Steven Duffy), Eddie (Paul Doonan), May McCann (Ellie Haddington), Malcie (David McKay), Malcie's Mother (Ann Louise Ross), Tricia (Libby McArthur), Sarah (Kathryn Howden), John Joe McCann (Robert Carlyle), Christy McCann (Michael Stewart), Jackie McCann (Billy McElhaney), Ian (Matt Costello), Davey Fenton (Tom McGovern), Carol (Mandy Matthews), D.S. Alistair Wright (Alexander Morton), D.C. Gordon Monk (Gilly Gilchrist), Young Jo Jo (Thomas McTaggart), Clare (Lizzy McInnerny), Billy (Billy McColl), Christy's Mate (Craig Moncur), Eddie's Father (Malcolm Shields). Jo Jo McCann (Robert Carlyle) shows his scrapbook of press clippings on his criminal career to impress his new girlfriend, Marilyn Monroe-wannabe Lorraine (Jenny McCrindle). I only have 2 neurons and one of them is usually sleeping. So, did Kevin sing in this movie? In Latin, the word "Genius" usually meant "The tutelary god or attendant spirit allotted to every person at his birth, to govern his fortunes and determine his character, and finally to conduct him out of the world". A four part film series directed by John Mackenzie and produced by Deirdrie Keir for BBC Scotland starring Robert Carlyle. The series was shot on location in Edinburgh and Glasgow with studio work in Glasgow. Maurice Cain designed. I was Art Director. Hey guys! I am hoping to harvest some night-relevant B2B leads for our B2B division of our online vape shop. Has anyone previously used the <a href=https://wowitloveithaveit.com/products/yoggys-money-vault-email-extractor-and-search-engine-scraper-software-harvester-yoggy>Yoggys Money Vault seo tools</a> for extracting B2B Leads? Would you recommend it?